The first thing those who know me say is “I’m not surprised you’re building another RV, but why an RV-12”? They ask because they know that I have built two RVs before, an RV-8 and an RV-3B (web sites for each, here, and here), and that I tend to gravitate to performance-oriented machines whether airplanes, cars, or motorcycles. They also know that the RV-12 is the slowest aircraft Van’s makes. It’s an aircraft designed to conform to the LSA category and is therefore designed to have a maximum continuous cruise speed of 120 KIAS (138 mph) whereas all of the other RV models will easily top 200 mph and cruise close to that. So, how do I answer that? It’s complicated, but let me see if I can explain. Though I’m not new to the RV world I have been away from it awhile — I took a break for about 9 years with a job stint at CubCrafters. In 2018 however I joined Dynon Avionics, moved back to the Seattle area where I’m originally from, and no longer had any company aircraft to fly whenever I want. Hmm, need to fix that. Further, in my new role as V.P. Marketing & Sales at Dynon I need to be fully up on the avionics world which of course spans both VFR and IFR ops. While I’m fully up on all of today’s EFIS systems I’m not fully educated on much of the IFR functionality as I’ve never taken the time to get my instrument rating. I’ve been intending to get it for literally 20 years but have just been busy with RVs, glider rating/flying, formation flying, and even seaplanes via Cubs. My second build, an RV-3B. Yea, I kinda like this paint scheme, slightly darker gray this time. It was time to fix both issues so in fall 2018 I made a commitment to do two things: 1) get my instrument rating, and 2) acquire an aircraft. Never one to let the grass grow under my feet I started into my instrument rating training and immediately began figuring out an aircraft solution. First up was the decision to buy or build an aircraft of my own, and should it be a conventionally certified plane or an E-AB? 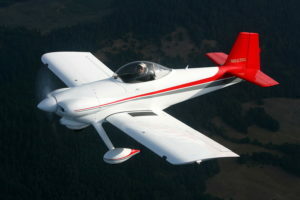 I considered both, but once you’ve known the satisfaction of building your own aircraft, once you’ve experienced the freedom from the burdensome and often senseless regulations for conventionally certified aircraft, and most importantly once you’ve experienced the handling qualities of an RV, you just won’t want anything else. So, another RV it would be. Now, which model, and buy or build? I looked around quite a bit and really tried to find an RV to buy. The fact is though every aircraft available was a compromise of some sort. When you build an aircraft yourself you make every single decision. It’s a very satisfying experience that is frankly difficult to describe, but when I thought about what I’d need to change on all of the candidate aircraft I realized it would be a better path to just build it myself again. As busy as I am at work though I really didn’t want to take on another 3,000 hour aircraft project. That, and the fact that Van’s had just recently updated the RV-12 into the RV-12iS prompted me to investigate. The RV-12iS upgrade to the RV-12 was centered around incorporating Rotax’s new 912iS fuel injected computer controlled engine, but also included a long list of airframe upgrades that I suspect Van’s had been accumulating for some time. The more I learned the more I discovered that this is an extremely efficient little plane with the shortest build time of anything in their line. It was also a side-by-side model which I wanted for avionics purposes. But does it fly like an RV? That’s important, I’d come to really appreciate the absolutely superb handling (especially the RV-3!) of the RV family, they are simply unmatched. Frankly, it spoiled me. Of all the aircraft I’d flown while I’d been away nothing was even close. So, one fateful day in October of ’18 I made my way down to Van’s and took a test hop in the RV-12iS. Yep, still flies like an RV! 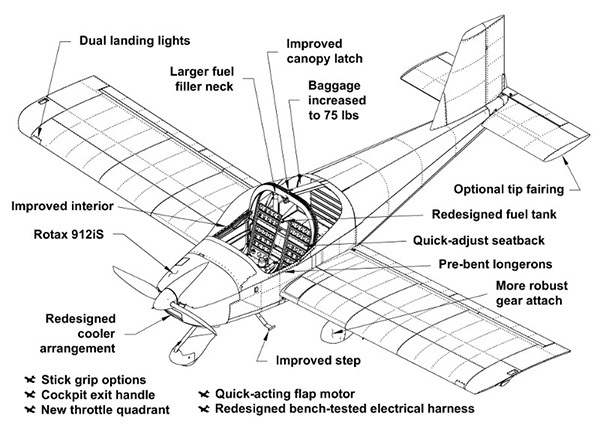 A plane I can build fairly quickly, preferably 1,000 hours or less. A plane that I can build IFR capability into, use for IFR ops, and use for product testing. A plane that I truly enjoy flying for the pure joy of it! With the aircraft decision made I then ordered the emp/tailcone kit and began digging out all my old tools and getting my workspace set up. The first kit arrived and I was back building again after a decade-long break. It felt good to be back, I’d forgotten how much I had enjoyed the building process! 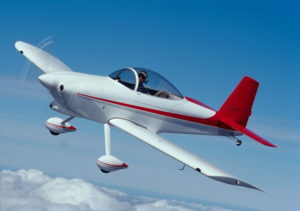 The vast majority of RV-12 builders have built and certified their aircraft as E-LSA. I’m planning a bit different approach with this plane, see the next page for the story on certification category options and my plan.